Here, a photo stylist uses a chandelier as a prop over a claw footed tub. This is why very special, sealed light fixtures are used in pools and spas. It is why special shower rated recessed cans are used over tubs and showers. You may be able to find some really lovely shower rated fixtures, like this one, from The Bath Tub website. We all learned, in grade school, that electricity and water are a potentially deadly combination. And yet, we still see pictures like this on design blogs, and in magazines. This bathroom design is the work of the very gifted furniture and textile designer, Barry Dixon. Barry Dixon has worked in the decorating industry for many years, and his talent as a decorator is remarkable. the chandelier was not over the bathtub at all, and that it is a trick of the camera. Many of these images are absolutely stunning, and are the work of very gifted stylists. There is a big difference, however, in a space that has been styled to look pretty in a picture, and a space designed for living. This bathroom was styled by decorator to the stars, Nate Berkus. Nate Berkus is personable, and fun, and his styling is absolutely beautiful. this way for the sake of photo composition. 410.4(D) Bathtub and Shower Areas. No parts of cord-connected luminaires (fixtures), hanging luminaires (fixtures), lighting track, pendants, or ceiling-suspended (paddle) fans shall be located within a zone measured 900 mm (3 ft) horizontally and 2.5 m (8 ft) vertically from the top of the bathtub rim or shower stall threshold. This zone is all encompassing and includes the zone directly over the tub or shower stall. location, offset from the area directly over the tub by several feet. Baths and showers are considered wet locations, and there is risk of steam from your bath condensing on the fixture, creating a short that could make the entire fixture "hot". Additionally, just the tiniest little splash of water could result in a hot bulb shattering, and sprinkling the tub with tiny shards of broken glass! Electricity and water do not mix. Period! Someone might just one day reach up and touch the chandelier. You can’t tell from looking at it if it is properly grounded or not or if it has a short that’s otherwise not obvious. Standing well-grounded in a bathtub full of water, THAT’s a recipe for disaster! Ok, ok, YOU of course won’t EVER think of doing that, but what about your house guests? Another point to think of: Working day-to-day in a lighting showroom and seeing first-hand what a mess it is when a light bulb breaks, I for sure don’t want to share my bath water with those little sharp pieces! A single drop of water hitting a lit bulb can easily cause a light to burst. You might consider a non-electrified chandelier, if you really have your heart set on having one. Chances are, if you live in a jurisdiction that has adopted a building code, NEC410.4(D), or something similar, is being enforced. credentials, as well as check into your local codes. It is remotely possible that your local building codes (or lack of) will permit the installation, but most qualified design professionals will still advise against it for safety and liability issues. If you really want to "romance the bathtub", how about this lovely mosquito net -- or some candles? Of course, you can use a chandelier in the bathroom, just remember to keep at least eight feet between the top of the tub and the bottom of the hanging fixture or stay at least three feet away from the "footprint" of the tub, if you want it to pass the electrical inspection. And remember, there are lots of people in the design industry who are not qualified interior designers, kitchen or bath planners, contractors, lighting designers, or architects. There are room stylists, photo stylists, set designers, shelter magazine editors, decorators, design bloggers, television show hosts, and consultants -- with backgrounds in everything from fashion to law. They may be incredibly talented artistic contributors to the design industry, but they may not have a familiarity with relevant local codes, being more aware of the beauty side of the design equation, than the health and safety aspect. This is just a little food for thought, as you peruse books, magazines, and blogs that may feature these types of installations. I always wondered where they allowed hanging a chandlier over a tub. I swear I saw Candice Olsen do it on one of her shows. And keep the candles several feet away from the mosquito net, too. Great point about the candles and mosquito net! I thought about mentioning some candle safety issues in the post,but decided to keep the focus on electrical safety. Thanks for the comment! How wonderful to bring this to our attention. You are right in that this is not something we would naturally think of when designing our new bathroom for it's beauty! I have also seen low hanging lights over kitchen sinks! Well done! Electricity and water both have their place in the Bathroom....I certainly prefer my water in the tub and shower and the Electricity in the light switch....a good distance apart! I did have a sealed can fixture installed in the shower...I highly recommend them...with the switch on the wall by the door! good information, we have an older bathroom and most things are safe except for the outlet right by the sink that worries me now and then. I really like the chandelier shower curtain! I always wondered if this was just me being paranoid about lamps around tubs...I'm glad you pointed this out and in such a concise and logical fashion. Thanks for an informative and well written link to Alphabe-Thursday. You are really excellent at this. I sometimes wonder whether designers have ever lived in a normal house with real people and real wet water in the bath! What an informative and well grounded post! What a great public service post! I always wonder who on earth could actually live in those fancy bathrooms! I really don't think most of these rooms are very practical. They must have someone come and dust the chandeliers. 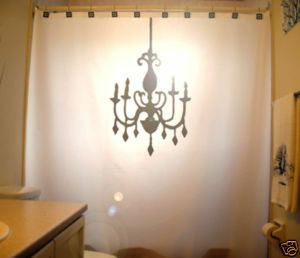 I love the idea of the shower curtain with a chandelier on it. Mike Holmes would be proud of you for writing this article. Thanks for sharing. just wanted you to know I love your gator story! I love all the great pictures - sometimes I wonder about the sanity of the home builders! Love chandeliers -such unsurpassed elegance! Interesting post. I'm shocked that anyone would even consider putting a chandelier in a bathroom. I guess I am way too practical. 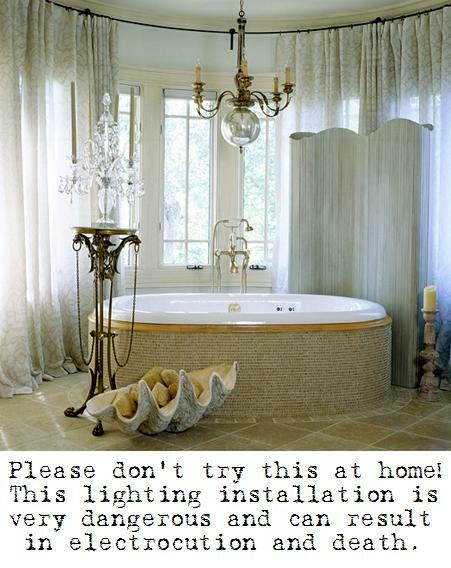 I'm with EG... what a silly notion to put a chandelier anywhere close to a bathtub! Happy E day! I too have always wondered about a chandelier over the tub. So, pretty, but safe? Thanks for dropping by my blog creativesouthernhome.blogspot. I have enjoyed looking around your blog and you have some GREAT information and inspiration! I'm in the middle of a bathroom redo and am pretty stuck trying to come up with some tile I like. Maybe you could come over and take a looksee???? A chandelier over a tub would make me nervous...But it sure looks neat! JoAnn, I'm sure we can rig a reinforced, non-electrified version for you and Tarzan! Maybe I have a really sick mind (or have one episode too many of Six Feet Under), but I keep picturing the chandeliers falling right into the tub. Yikes! Nicely done, as always, my friend. Those vignettes sure looked pretty...but I'm psychotically afraid of that bathtub/chandelier combination. I also appreciate the care you took to praise the obvious talents, yet you showed us what they may not have considered. Or just ignored for the sake of a picture. I don't unplug my hairdryer when I am finished using it. I also store it in the bathtub..... Is that bad? great information! Pretty is not always wise. Great points, all. What looks pretty in a picture doesn't always translate into common sense! OK.....those were awesome photos of bathtubs and chandeliers. Scary...but beautiful. That whole electricity and bathtub has always scared me..ha. I loved the mosquito netting though. I like your E post.